At the global launch of its Lumix S1 and Lumix S1R in Barcelona on January 31, Panasonic also revealed its plans for its new full frame mirrorless camera system in a fast-moving big-screen presentation. And in a blink-and-you’ll-miss-it-moment it showed a slide which revealed not only its own plans for native Lumix S lenses but also those of Leica and Sigma. Three Lumix S lenses are available right now, but that still leaves lots of gaps. We do know from Panasonic's previously published roadmap, though, that we can expect a 24-70mm f/2.8, 16-35mm f/4 and a 70-200mm f/2.8 in 2019. The 70-200mm f/2.8 is especially important but we don't expect it to be small – the 70-200mm f/4 launched with the S1 and S1R is no lightweight. 2020 will bring a super-telephoto lens, two primes and a macro lens, but that's all the information so far released. The Panasonic roadmap is only part of the story, of course, because Leica and Sigma will be producing L-Mount lenses too. The Panasonic Lumix S system is still in its infancy, but with support from Leica and Sigma it has two valuable allies. The first revelation was that there will be no fewer than 18 L-Mount lenses from Leica by the end of 2020. Leica already makes 8 L-Mount lenses for its Leica SL camera, which also uses the Leica L-Mount, which cover popular zoom and prime focal lengths (albeit at considerable cost!). Leica also make adaptors to allow its own R-mount, M-mount and S-mount lenses to be used on L-mount cameras. But that still leaves ten Leica lenses to come by the end of next year. We do know that 35mm f/2 and 50mm f/2 Summicron lenses are coming in 2019, and 21mm f/2, 24mm f/2 and 28mm f/2 Summicron lenses are scheduled for 2020. Leica already makes L-Mount lenses like this (super-expensive) super-wideangle Vario-Elmar 16-35mm f/3.5–4.5 ASPH. and more are coming. 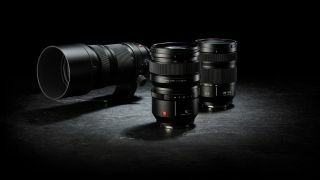 Leica lenses are traditionally fearsomely expensive, so these new Leica optics may be of interest only to high-end users and demanding professionals, but at the other end of the scale Sigma has built its business on making high-quality lenses at much lower prices than own-brand equivalents, so the news that there will be 14 L-Mount Sigma lenses by the end of 2020 was even more exciting. Panasonic did not say what these lenses would be, but we have already been told by Sigma that they are the same 14 lenses which have already been adapted for the Sony FE mount and include wide-aperture primes from 14mm to 135mm. Sigma will also be making two mount adaptors, allowing Canon EF and Sigma SA mount lenses to be used on Panasonic S1 and S1R bodies, as well as on the Leica SL and its own yet-unnamed L-mount camera. Panasonic, Sigma and Leica are of course the three companies that make up the L-Mount alliance announced at Photokina 2018, but until now Panasonic’s partners have been pretty quiet. Hopefully, we will now see the number of L-Mount lenses grow quickly. This is essential if Panasonic is to make a serious dent in the full frame mirrorless camera market with its Lumix S1 and Lumix S1R. Sony already has a big lead in its native lens range, but Nikon and Canon are still in the early stages of populating their full frame mirrorless lens ranges – so if Panasonic is going to strike, now’s the time to do it!